Many first-responders say that The Salvation Army is the first to have boots on the ground and the last to leave when disaster strikes. This is because we're already present in most communities. Our staff and volunteers are part of that community, working for weeks, months or even years to help their neighbors until the scars of destruction are covered with hope and renewal. Our disaster services teams also respond year-round to local emergencies - like house fires - serving survivors and first responders. Natural disasters in the U.S. cost over $300 billion dollars in 2017 alone. Devastating hurricanes, wildfires, extreme flooding and tornadoes destroy more than homes; they break spirits and hearts. to survivors, home and abroad. See how we responded to communities affected after the 2015 Nepal earthquake. As one of the nation's major emergency relief organizations, The Salvation Army recognizes the critical importance of being prepared for natural and man-made disasters. Therefore, we work to educate other disaster professionals and the public at large about how to prepare for and respond to emergency situations, while also taking steps to ensure our own ability to respond quickly and efficiently. Our emergency response services are activated on short notice, based on notification from federal, state and local governments. Typically, Salvation Army personnel and resources will congregate at predetermined staging areas, entering the impacted area as soon as government first-responders have indicated that it is safe and constructive to do so. These immediate response activities include food and hydration services, shelter, cleanup and emergency communication assistance to put victims in touch with their loved ones. We work closely with other disaster relief organizations and government agencies to maximize our impact and avoid duplicating services. We are also an active member of the National Voluntary Organizations Active in Disasters (NVOAD) and work with state and Federal agencies to provide assistance. Depending on the magnitude of the disaster, The Salvation Army may continue providing immediate response services such as emergency shelter and food service well into the recovery process. Additionally, we often coordinate with government entities to develop long-term disaster recovery plans. These activities include restoration and rebuilding initiatives, disaster social services to address basic needs, medical expenses, or funeral costs, and in-kind donation distribution to disaster victims. During a major disaster, time is of the essence in letting families know their loved ones are safe. We locate survivors and provide information to their family and friends through our Salvation Army Team Emergency Response Network (SATERN). Our mobile kitchens travel the streets to provide hot meals to survivors and relief workers. We also set up meal stations near busy work sites or in community buildings where neighbors and volunteers gather for support. In major disasters, we set up hubs that provide shelter, meals and counseling, often working with other agencies. When the best option is a short-term hotel stay, we cover the bill. In major disasters, we can coordinate or assist with cleanup and reconstruction. We have troops of volunteers to enlist for large projects like this. We also provide hundreds of thousands of clean-up kits to disaster survivors annually so they are able to get started on the road to recovery. We know it won’t undo what’s been lost, but we can offer financial help as a step toward a brighter future. We have short-term grants for medicine, groceries and other pressing needs. When the road back to normal is a bit longer, we partner with other agencies to give you long-term financial help. You never have to worry about repaying anything we give. Your help will do more than help rebuild homes — it will repair lives. In times of disaster, the best way to help is with a financial gift. A donation today ensures we're able to respond tomorrow. We need people like you, ready and willing to help at any moment, to join our team. To be considered for service when the next disaster strikes, you will need some training and education in advance. We are always seeking skilled retired or semi-retired professionals to serve in a number of leadership functions as well. A $50 donation to The Salvation Army buys 10 gallons of fresh water for disaster victims and first responders. Donate now. 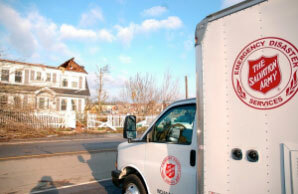 A $50 donation to The Salvation Army buys 20 tarps for families who have lost their homes. Donate now.